Employers and employees will be able to negotiate whether and when employees will get rest and meal breaks. If they can’t agree and the employer has business reasons to restrict breaks (for example where an employee has sole charge in a retail outlet), the employer can specify whether and when the employee can take breaks. All employees will have the right to request flexible working arrangements. There is no limit to how many requests an employee can make per year. The employer must respond to each request within one month. When collective bargaining is taking place, either party (employer or workers) can walk away from negotiations. Employers can opt out of multi-employer bargaining (i.e where there are a number of employers in an industry, and some or all of them enter negotiations as a group). Employers can offer individual employment agreements to new employees, whose work is covered by a collective agreement but who are not union members, from the outset of the relationship (rather than waiting 30 days). An employer can dock the pay of employees who are on partial strike (e.g work to rule, go slow). Written advance notice will have to be given of any proposed strike or lockout. More information to the changes can be found on the Ministry of Business, Innovation and Employment’s website. 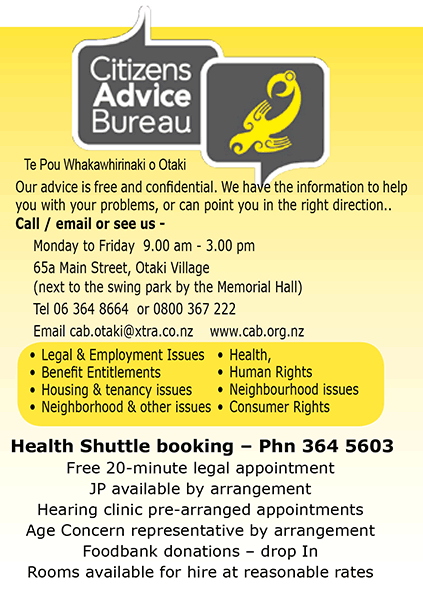 You may also visit our public website: www.cab.org.nz. If you are not sure, ask us — email, phone or visit your local bureau. We can assist you with further information.